TechCrunch Disrupt, the conference--offering impressive panels in big businesses, investors, and startups to commingle together hosted by no other than the emerging giant tech blog TechCrunch, began yesterday--harnessing about 100 Startups launching their latest and greatest inventions right here in NYC at "Startup Alley." Mayor Bloomberg who was amongst one of the special guest attendees at the tech event on day one, had this to say about the latest entrepreneurship scene brewing in New York, "When you want to start a business, you don't have any choice. This is where the best and brightest are," as the mayor encouraged entrepreneurs from everywhere to think of NYC as the new Mecca for startups. And frankly, we here at the NewsGallery have the same exact premonition. New York is becoming one of the new Meccas for inventors indeed--with the multitudes of weekly meetups cultivating a growing and blossoming community for all things startups. Our bet is this: It's only a matter of time until The Big Apple holds its very own against Silicon Valley. What do you think? Tripping -- a social network launched to share travel tips with others and connect with locals upon travelling to your desired destination. The goal here is to experience travelling through the locals' lenses rather than the disadvantage of being a tourist. Go HERE to learn more. WeReward -- An app that actually gives you the reward either when you've "checked into" a place (like Foursquare for example), then take a photo of yourself at the actual location or after you've made a purchase and if you take a photo with the product, even if it's been delivered to your home, if you post the image on the web, you can now get paid for doing so. Go HERE to learn more. 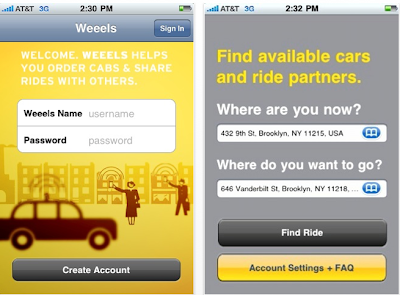 Weeels -- if you're a serial cab rider, well get ready for this: It's an app for cab sharing just for New Yorkers. Apparently there are about half a million cab riders a day, and about 150,000 New Yorkers would in fact share a cab ride, hence divi-up the fare with a complete stranger. Go HERE to learn more and sign up.